Whether you're landscaping or doing light residential excavating, site development, or underground work, the conventional-boom 75D will have an immediate impact on your bottom line. Neither too big nor too small, this right-size machine delivers all the power, smoothness, control, and ease of operation you've come to expect from larger John Deere excavators in an easy-to-maneuver package. Their compact size and reduced-tail-swing design allow them to rotate freely within a small radius. So they're more productive in confined spaces and around obstacles. With increased swing torque and drawbar pull, they produce like a big-time machine. And with a spacious, comfortable cab featuring an advanced LCD monitor, they operate like one, too. Rubber tracks and rubber pads are now optional, providing the ability to work on concrete without damaging the surface. 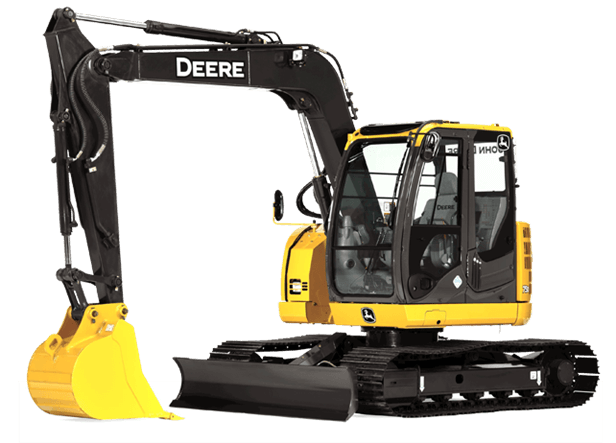 Other enhancements including a high-efficiency cooling system; rugged, turbocharged, fuel-efficient Interim Tier 4 diesel; and improved serviceability ensure the uptime and long-lasting durability you've come to expect from Deere.